Look out, a picky kid could possibly become a picky adult. I totally laugh because my dad is that picky adult! I literally never tasted a Brussels sprout until I was in my mid twenties. Maybe this doesn’t sound like an anomaly, but I had been raised to eat all sorts of things ranging from spam and american cheese to escargot and foie gras! 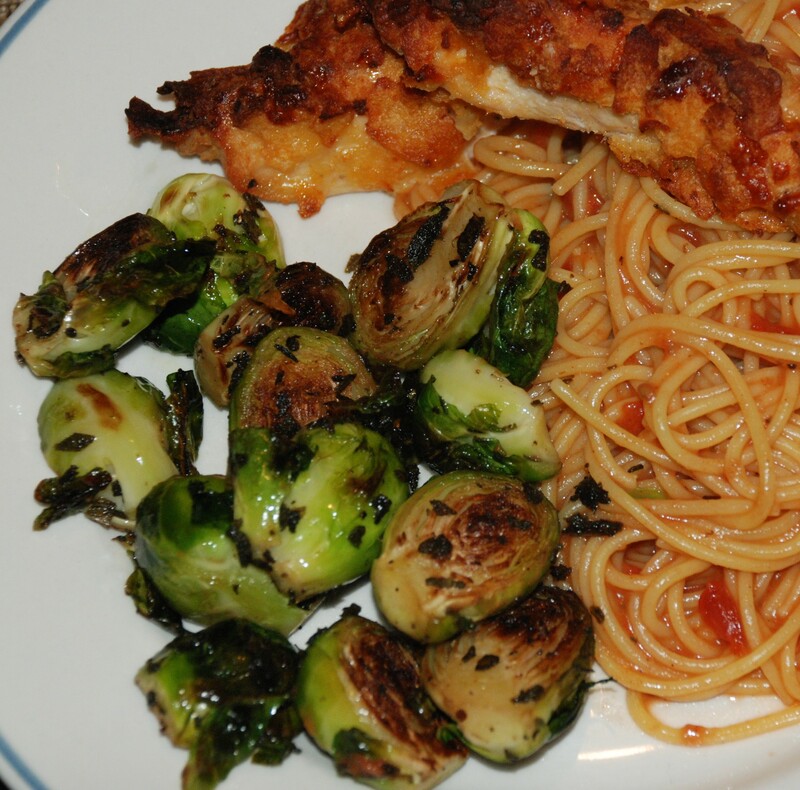 So, what’s the deal with the Brussels sprout?? I had always heard tell of those funny kid stories about hiding the green gems under mashed potatoes, sticking them on the ledge under the dining table, stuffing them in cheeks and making trips to the bathroom (only to flush the evidence down the toilet). 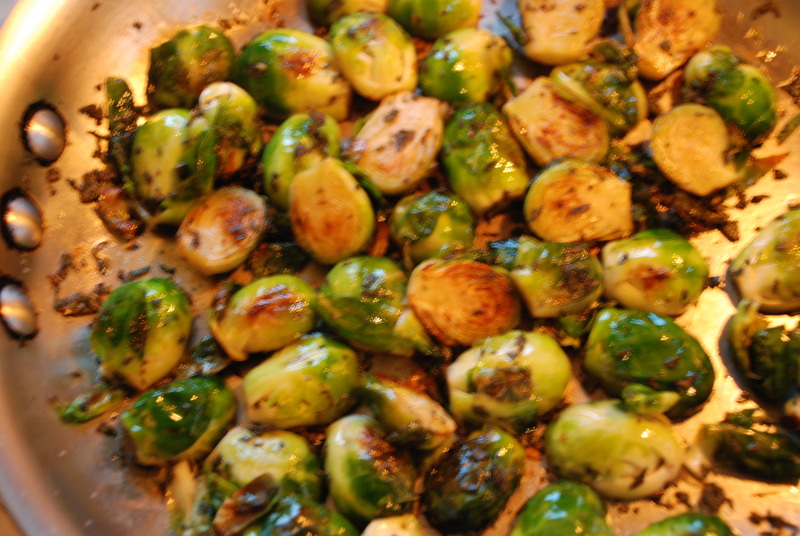 I always laughed, and dismissed Brussels sprouts as little nuggets of undesirability. Here is where my dad comes in…I reached my twenties and finally had the epiphany that I had never actually eaten a single Brussels sprout in my entire life! I wound up asking my mom, “What’s the deal? Why the heck were they never on the dinner table?” Ta dah!! My dad! He had hated them as a kid and would pout when they appeared on the table early in their marriage. My mom eventually gave up…and apparently, she gave up before I was on the scene. So, I “manned” it up and ordered them at a cool little Italian restaurant….they sounded good..cooked with sage and browned butter. Soooo, I went for it. And, they were AWESOME!! Here is my take on this exquisite side dish. This ain’t no mushy, bitter Brussels sprout of yester-year. First step is to halve all your Brussels sprouts. Throw them into a large skillet with butter or coconut oil (if you are going for a vegan dish). When I say large, I mean large. You want all of your sprouts to have enough space to brown. 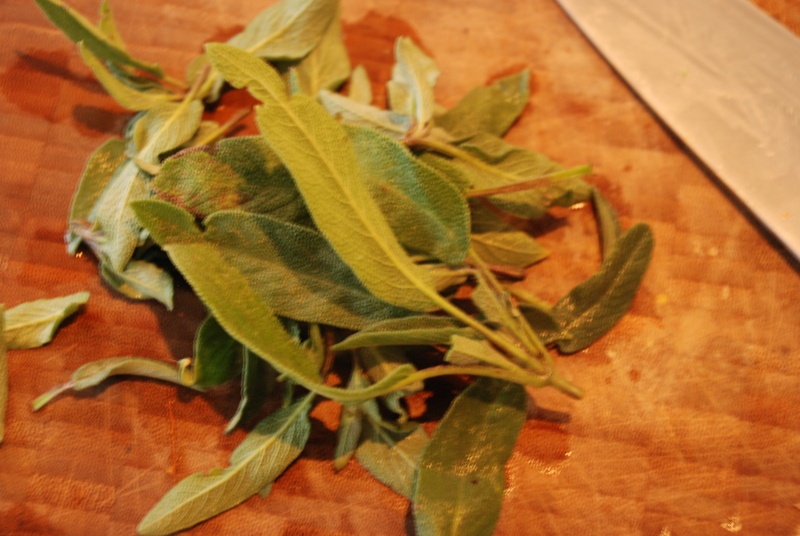 While your sprouts are beginning their transformation, get out some fresh sage to mince. 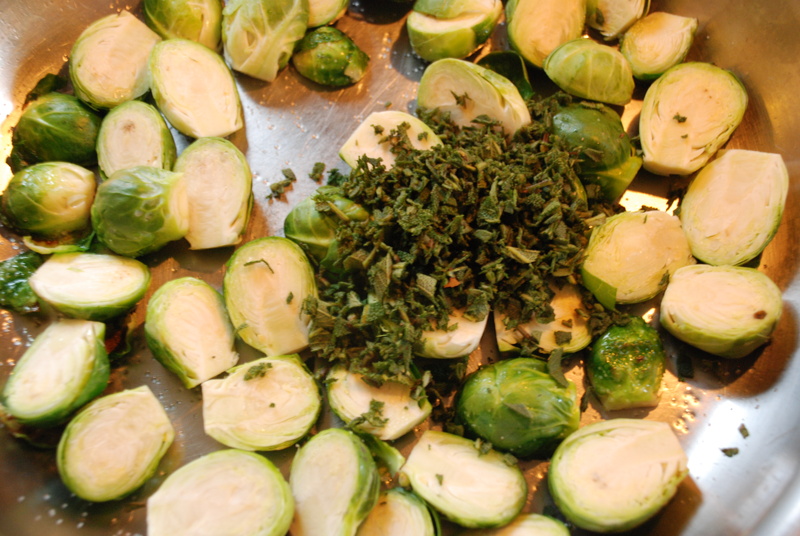 Along with the sage, give your sprouts a good dousing of salt. The process of sauteing them this way can take quite a bit of time until they are fork tender. To speed things up, you have two options: one would have been to begin the process with a quick toss in boiling water before you began the saute, but number two is the method that I usually go for, just throw a lid on your pan. 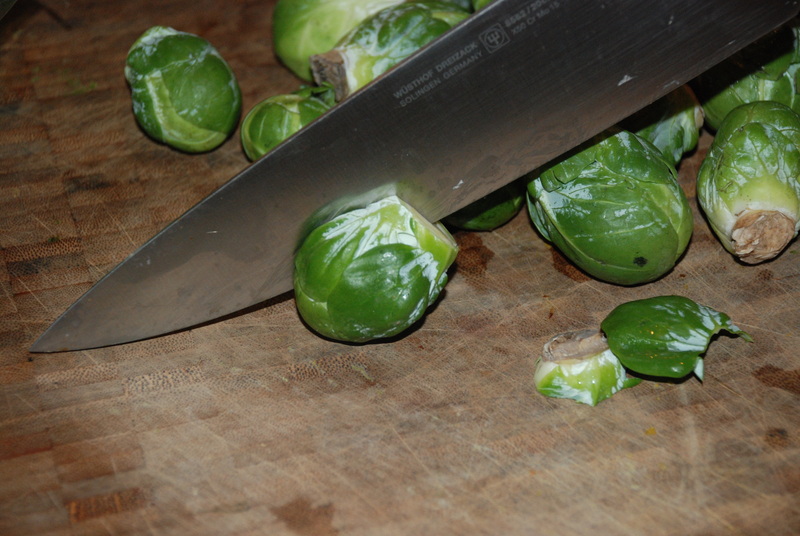 The sprouts will super heat with the lid and the browning process will continue rather unchecked. Just make sure that they are already browned a bit before you hit them with the lid, and make sure that you take it off for the last ten minutes before serving so that they maintain a nice caramelizing. (Our mission is al dente…NOT mush). These beauties are a great addition to all sorts of meals. Here I paired them in a simple Italian meal, but they would be amazing with a gorgeous pork tenderloin or a more complex vegan meal. However you serve them, I hope this dish helps to take away the stigma of Brussels sprouts for dinner 🙂 …I know that I have successfully converted many over to the Brussels sprout eating community after tasting these yummy morsels. 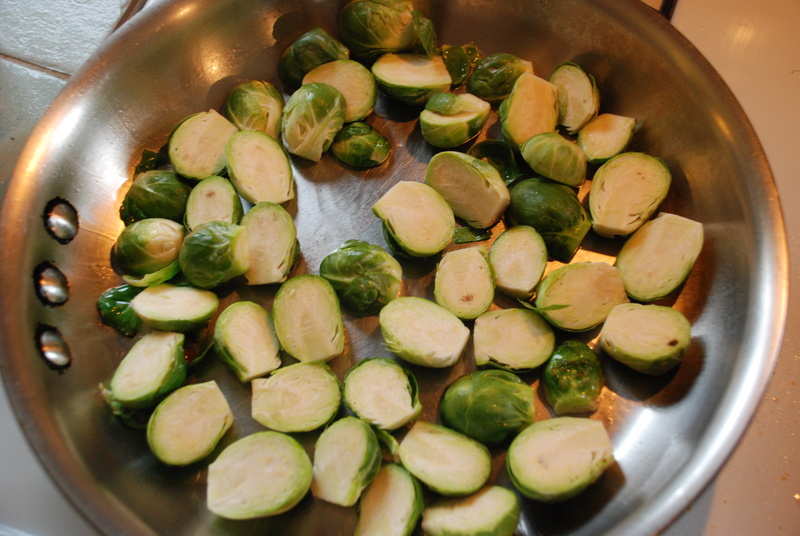 In a large skillet, saute the brussels sprouts in the butter (or coconut oil) with the salt and sage. Let them begin to brown before you cover them with a lid. Cook them with the lid for 10-15 minutes. Remove the lid and cook for 5-10 minutes. The sprouts should be fork tender with a good bite and nice n’ browned. Bon apetit!